My favorite month of the year is here!! Halloween is my most favorite holiday! I love the cooler nights and watching the leaves start to change. And of course COSTUMES!! Can you tell I am excited? What is your favorite holiday and why? Feel free to post a pic and tell me why it is your favorite holiday on Raspberry Moon Facebook or Instagram. Post a picture of your Halloween Costume(s) and you just might get a little sercie! One of my favorite costumes, inspired by my little niece (technically my little cousin), she loves Elsa and had a Zombie Elsa cake for her birthday. I found this prom dress at Ross for $13 so couldn’t pass up such a great deal! 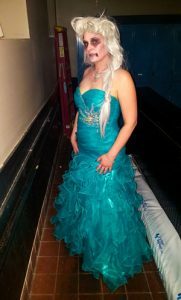 I plan on turning it into another costume some day – I was thinking maybe a Sea Goddess? Or what is your creative idea? Just as a reminder, there are 11 more weeks until Christmas Holidays. I would book now if you want to be sure you are smooth and glowy for Christmas and the New Year. I am working a lot the week before Christmas and then only the Thurs and Fri after Christmas. You can Fall in Love with your Skin by the Holidays with a 6 week Face Refresher Series – Peel or Enzyme Treatments depending on your skin type. Check out last month’s newsletter for more info. Have a safe and fun October! Y’all know how I love Turkish Food! New location, new time of year for some delicious food. I can’t wait! Check out their event page on Facebook to hear more details as they’re released. Recommended for normal, dry, sun-damaged, oily or acneic skin, helps with those pesky blackheads. Sensitive skin clients may use this product 1-2 times per week without irritation. This scrub exfoliates while brightening to promote a clear, healthy skin tone. Use daily after cleansing, massage retinol 2% exfoliating scrub into the face, neck and chest for one full minute. You can leave this on for up to 10 minutes. Rinse and follow with toner. If you are using some type of exfoliating acid already, please talk with me to see the best way to add this into your routine. I LOVE this Scrub/Mask. My skin feels so smooth and bright after using it. Jojoba Beads – provide the physical exfoliation component of the product. They gently buff away dead surface debris and leave behind jojoba esters, which are a moisture retaining component of natural skin sebum. Kojic Acid (from mushrooms) – lightens skin discolorations, slows the production of melanin, and assists in maintaining desired skin coloration after aggressive depigmentation treatments. Retinol – dissolves keratinization, resurfaces and smoothes the skin, and stimulates collagen production to improve skin quality and youthfulness. Citrus Medica Limonum (Lemon) – an astringent that purifies, tones, and brightens the skin. It also promotes taught, toned skin tissue. Malic Acid (from Apples) – enhances desquamation of the stratum corneum and improves the appearance of the skin. Zanthoxylum Americanum (Prickly Ash) Bark Extract – encourages healthy circulation and provides gentle stimulant properties to promote healthy oxygenation. It is also anti-inflammatory. Complimentary Travel Size for everyone that comes in for a service the month of October. 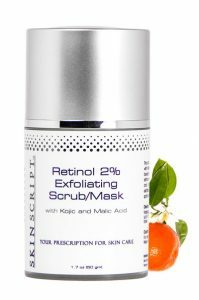 $43 – Purchase the fabulous Retinol 2% Exfoliating Scrub and receive a FREE Goody Bag. I was catching up on some of my spa magazines and I came across an article called “Snack Attack – Eat well, even between Appointments” by Lynn J. Parentini. I thought I would share her tips and add a few of my own. We are all so busy it is hard to get everything done sometimes. I am lazy and although I know how to eat healthy sometimes it is hard to make myself. 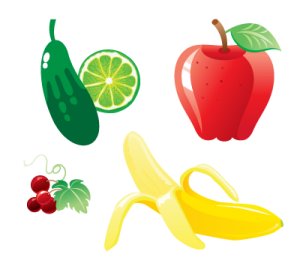 So here’s a list of ideas for healthy snacks – eating small portions 5 to 6 times a day is ideal. Pretzels, or chips made from plantains, kale, taro, sweet potatoes, kale, etc. Turkey Roll-ups – Turkey, cream cheese/hummus or some other type of spread roll up and eat. Stuffed peppers, cabbage leaves or romaine lettuce – meat, cheese, avocado, cucumbers – whatever you want really, basically a sandwich without bread. Hope that gives you a few ideas for something different. I am going to be playing around with my Insta-pot and Air Fryer so I will let you know how that works out. What a perfect treatment to get you in the festive spirit. 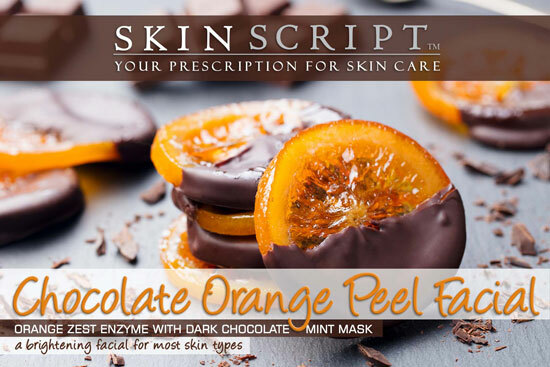 Delight your senses with the citrusy tang of Orange Zest Enzyme and indulge in some guilty pleasure with Skin Scripts Dark Chocolate Mint Mask. The Orange Zest is a powerful antioxidant that brightens the skin with 4% Lactic Acid and 1.5% Glycolic Acid for a gentle, yet effective exfoliation, delivers high levels of Vitamin C for superb anti-aging properties, and creates oxygenation in the skin for a fabulous holiday glow. The Cacao in the Dark Chocolate Mint Mask creates a vasodilatory effect and will create flushing for an exchange of toxins within the skin. Cocoa, glycerin, and squalene (from olives) are excellent emollients, lubricants, and humectants to draw moisture to dry, flaky skin. Vitamin E is an excellent anti-aging antioxidant.